We have D.I.Y. kits with instructions that deal with most of the common leaks. Be sure to find the true source of the leak before you buy parts. It is easy to be fooled as leaks can "travel" and you may think it is coming from one source when actually it is coming from some place else. Clean the transmission thoroughly, even if you have to go to a car wash. Dry it off with compressed air and run/drive the car just long enough for the leak to start. See Kent's free video on chasing transmission fluid leaks. Many times it is difficult to find the exact source of the leak. Here are some tips I used to isolate the leak source. 1. Dont ever assume that where you see the drip is the actual leak source (air flow under car causes fluid to travel). 2. Always clean the area first with spray cleaner and compressed air if available. 3. Then run or drive the car and immediately recheck the area in question. 5. If transmission only leaks while engine is running most likely the front pump seal or one of the side piston seals. 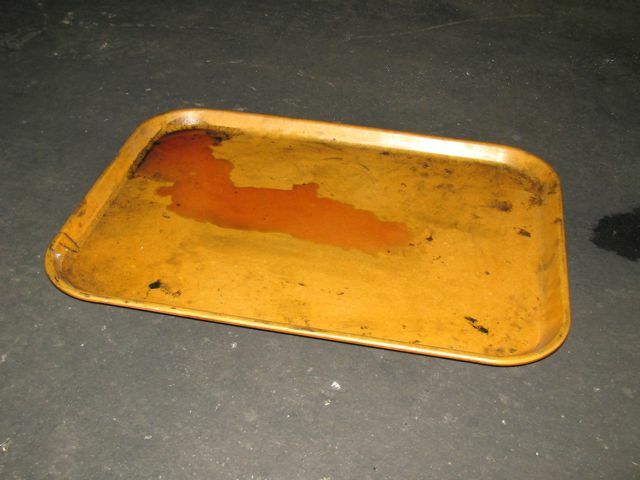 Note example below: I left a clean drip pan under the car for two days and look what I found. The leak was a non-pressure leak and upon close examination (after cleaning) I found a very small leak coming past the oil pan gasket. Re-tightening did not stop the leak so the pan is going to have to come off.